WASHINGTON – Manley Begay Jr. stood surrounded by boxes “stacked to the ceiling” that were filled with the remains of more than 1,000 Native Americans, when one label caught his eye. It was where Begay’s family took their livestock to winter on the Navajo Nation. 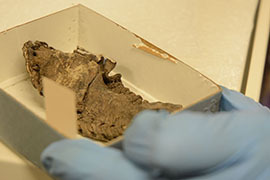 But here, at the Peabody Museum of Archaeology and Ethnology at Harvard University more than two decades ago, it was the label on a box of human remains. “It’s as though you’re experiencing the death of a loved one right before your eyes again and again and again,” said Begay, now a professor at Northern Arizona University. Back then, he was a graduate student at Harvard and part of the museum’s repatriation committee, formed in response to a new law – the Native American Graves Protection and Repatriation Act. But 25 years later, more than 70 percent of Native American remains are still in control of museums and federal agencies, according to the 2014 report by the agency overseeing the repatriation program. The Smithsonian National Museum of Natural History, for example, has refused since 2004 to return six “sacred objects and objects of cultural patrimony” to the Western Apache tribes in Arizona. And the American Museum of Natural History in New York has agreed to give tribes 77 items, but without the legal classification of “sacred objects and objects of cultural patrimony” that would confer ownership to the tribes – the items would essentially be on loan from the museum. Critics say both museums have ignored recommendations by NAGPRA and by Smithsonian review committees to return the items. 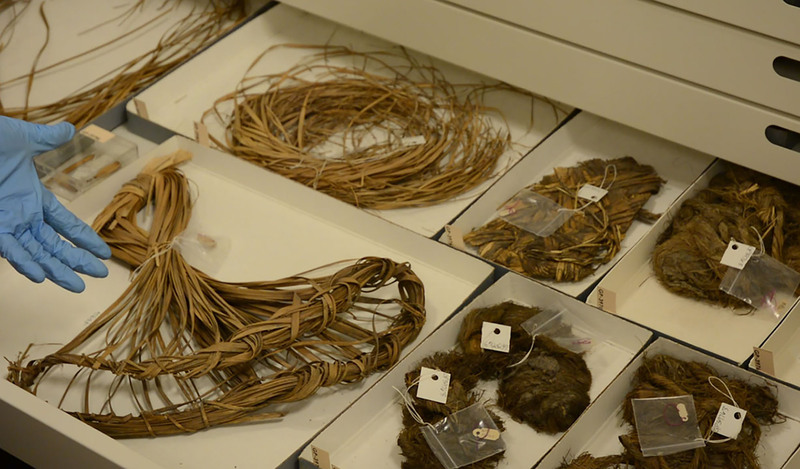 In a statement to Cronkite News, the Smithsonian noted that its National Museum of Natural History had returned 200,000 different objects and the skeletal remains of about 6,000 individuals to more than 100 tribes. That does not include repatriation by the Smithsonian?s National Museum of the American Indian, which operates its own program. 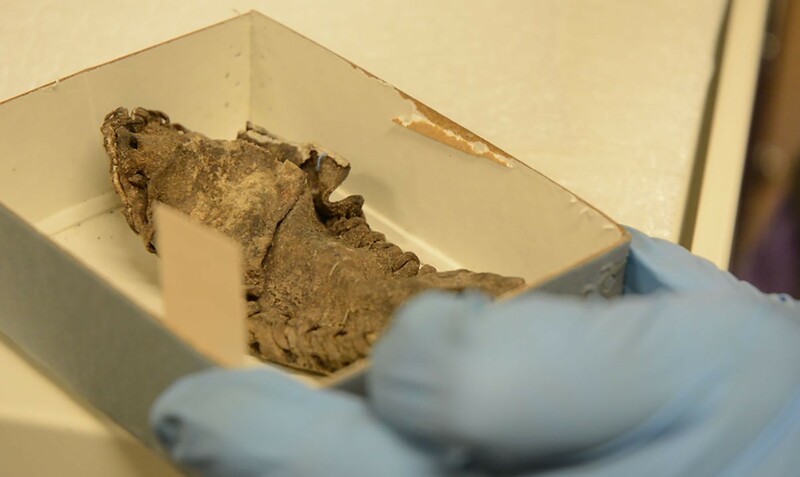 The Smithsonian statement said the six items referenced by the Apache were among nine, three of which – cradles from infant grave sites – have been offered for repatriation. But the other items – a shirt, a medicine stick, two medicine hats, a war cap and a wooden charm – have not been shown to have come from the Western Apaches or that they rise to the level of sacred object, the statement said. Tribal members chafe at the fact that they have the burden of proof and that museums and federal institutions are given final authority to decide whether to return items. They say institutions have dragged their feet for years, but the National NAGPRA office has little power to force compliance. The road ends there for the tribes. They have no power under the law to force the museums to comply. The law was intended to foster good faith between the scientific community and tribes by recognizing that the tens of thousands of Native American human remains should be treated with dignity and returned to their descendants. While consultation and collaboration between museums and tribes was supposed to be at the heart of NAGPRA, tribes have found in many instances that it is hard to overcome the prejudices of old institutions. “It’s the world of academia meeting the world of Native thought and understanding about life, and often that can clash,” Begay said. 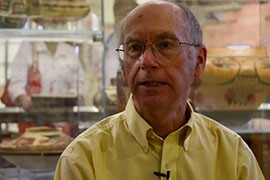 Randall has seen that clash with academics firsthand. Begay said he has seen a shift in viewpoints in the archaeology and anthropology communities, but it has been a “slow, snail-paced” movement. But still, the museums hold all the cards, said James Riding In, an associate professor of American Indian Studies at Arizona State University. Critics say problems with enforcement of the program are compounded by the fact that NAGPRA is part of the National Park Service. It has underfunded NAGPRA, they say, and it has its own conflicts – the Park Service has a collection of human remains and cultural items that qualify for repatriation. Grant money available to tribes and museums from NAGPRA to help with consultation and repatriation has fallen from a high of nearly $2.5 million in 1998 to just over $1.6 million in 2015. In fiscal 2011 and 2012, the National Park Service took $581,000 from NAGPRA grant money and moved it to support administrative costs, according to agency budget documents. But the National NAGPRA office said all federal agencies have had to tighten their belts. Sequestration is not the only problem the National NAGPRA office faces. It lost its civil penalty investigator in 2010, and while O’Brien said a new one was hired six months ago, there are 63 backlogged cases against museums for failure to comply with the law. The office can prescribe civil penalties for museums, but advocates say those penalties – $42,679.34 paid by nine such facilities since 1996 – are “pennies” to large institutions. There is no avenue under the law to encourage federal agencies to comply. The agencies have returned less than half of the human remains they held when the law was passed. 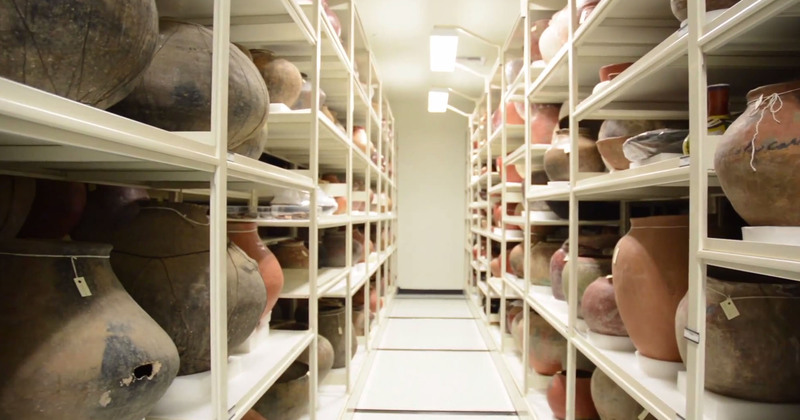 For museums, the exact number is uncertain because reporting the information to the national office is voluntary, but the latest report from National NAGPRA estimates museums have more than 140,000 human remains left to be repatriated. 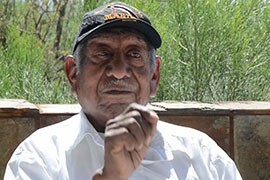 “While much is being made of foreign auctions and the like, and the efforts of Jews to get back artwork stolen during the Holocaust, museums in this country are still falling short in returning items taken in the Native American Holocaust – by those very same museums – even when faced with completely legitimate claims,” said Seth Pilsk, a tribal official for the Western Apaches. For tribal nations the “human remains, funerary objects, sacred objects and objects of cultural patrimony” that NAGPRA dictates be returned are integral to their religious and cultural identities. “I didn’t know those individuals but they’re still my people, they’re who we came from,” Riding In said. “And I don’t put a timeline on that feeling. 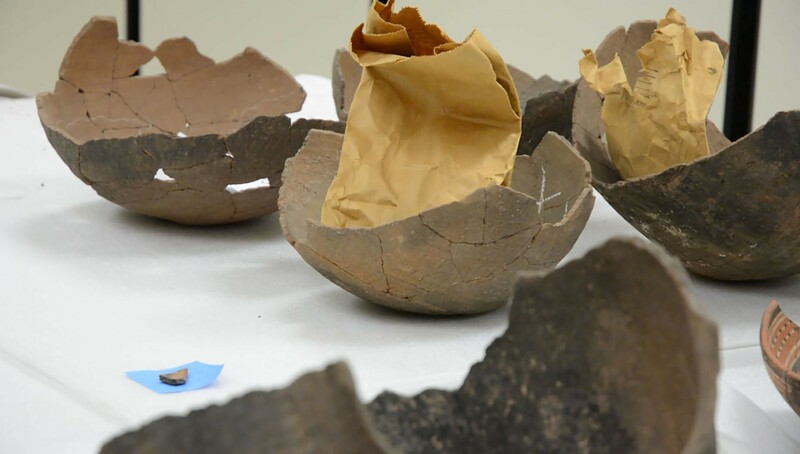 “It can go back deep in time that these are our ancestors and they deserve full human rights and no one asked them if they consented to be dug up and put on display and studied,” he said. Many nations believe that social ills like alcoholism and domestic violence are caused by the unrest of their unburied ancestors, and because objects the tribe considers holy have been separated from the people. “Those who don’t fulfill the spirit of the law, if that doesn’t happen, then these traumas continue to happen,” Begay said. 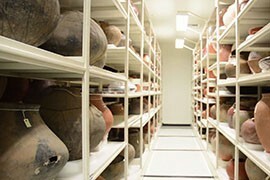 Pottery is often found at Native American graves. 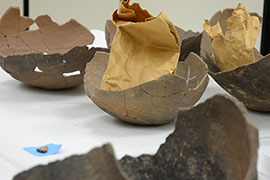 These were not taken from a gravesite, but represent common utilitary ware. Suzanne Eckert, head of collections at the Arizona State Museum, holds a small moccasin in the museum's collection. 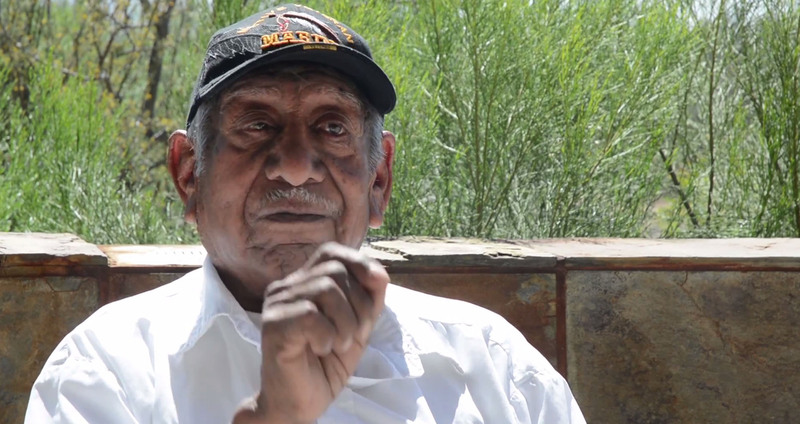 Joseph Joaquin, cultural resource specialist for the Tohono O'odham tribe, works for the repatriation of tribal remains and artifacts, saying they don't belong on a museum shelf but with the people. 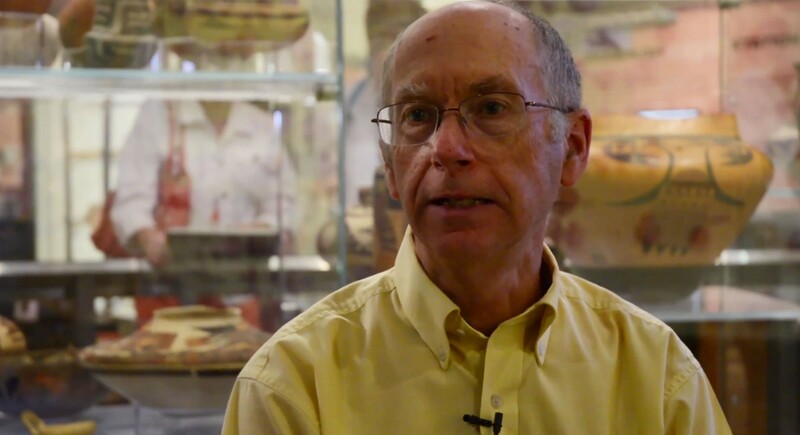 John McClelland, who oversees the Arizona State Museum's compliance with the Native American Graves Protection and Repatriation Act, said his work with tribes has changed the way he view remains - what used to be just an object is now a person to him. 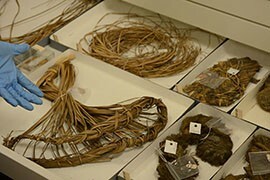 An Arizona State Museum official points to baskets in the museum's collection that are in various stages of weaving. These were not excavated from Native American graves, but they are the type of objects that are typically found in burial settings. Just some of the collection of Native American artifacts at the Arizona State Museum.